There is a bigger worry now. Hurricane Dean is now a Category 4, and the south coast of Haiti is under a hurricane warning. In order to get to the hospital all of these people need to cross a very wide river. 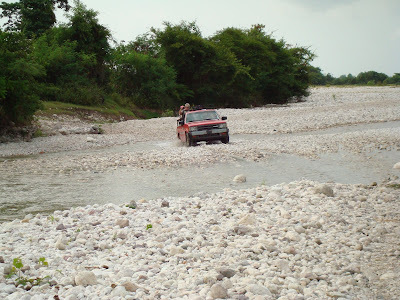 Normally it's empty, just full of large stones, and we drive across it (see photo). However, with rain it will fill up very quickly and become a dangerous torrent. It's likely this may even occur ahead of Sunday with rain that will be advancing ahead of the storm. In all likelyhood the doctor's appointments will be postponed or cancelled. We're praying that they will be postponed, but more importantly that sometime today MSH will be able to get word to the three patients. They don't have cell phones, so another trip to their village is necessary. 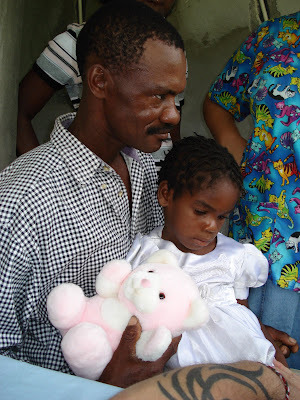 Email and phone communications with Haiti will be difficult, if not, impossible for a few days probably.